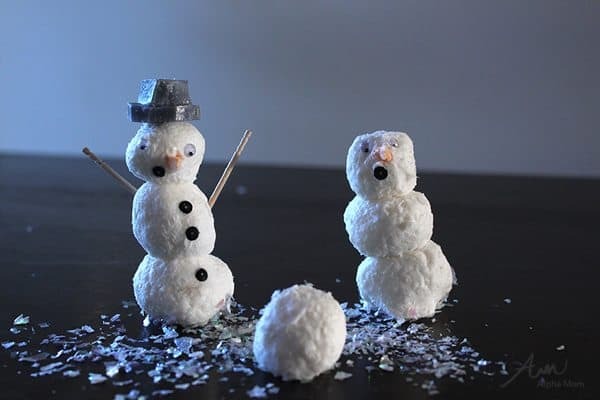 While you all are experiencing your polar vortex, we here in Southern California are making up for all our lack of snow with some fun indoor wintertime crafts. Like some snowmen soap for example! You’ve heard of snowball soap, right? We took it up a notch for you. This craft is very easy and very messy in a super fun way, kind of like making a real snowman out of snow. In fact, this craft relies on your own creativity just like creating a snowman would. How are you going to make a hat or buttons or arms? By using what you have, right? Sequins could be eyes, little branches could be arms. Dark-milled lavender soap could be carefully carved into a snowman hat or maybe stealing from Barbie’s ski outfit might be easier. 1. Grate the white soap into a bowl. Be careful not to let children grate the soap down to the small parts, they could accidentally grate their little hands. 5. Add a small sliver of orange soap for a carrot nose, googly eyes and dark bits for buttons and smiles, top with a hat or maybe a tiny scarf and you’re done! The snowmen aren’t super sturdy. They won’t hold up to heavy washing or anything but they are really fun to make. This craft is more about the process than the end result. But the end result is cute and if your plumbing can handle it, probably super fun in the bathtub too. We wrapped ours up in plastic sucker bags and gifted them to friends. That is super adorable. With the same process I guess you can make pretty much any shape, but the snowmen are really cute! Wow…this is really cute idea of making snowman soap. I just love this idea. I think my swt daughter Anna will definitely like this idea. Brenda…thanks for such creative and adorable idea. Adorable idea and super cool that you dn’t have to freeze to do this.